N.B. : Washington Times title: "Islam and its infidels"
What motives lay behind last month's Boston Marathon bombing and the would-be attack on a VIA Rail Canada train? Leftists and establishmentarians variously offer imprecise and tired replies – such as "violent extremism" or anger at Western imperialism – unworthy of serious discussion. Conservatives, in contrast, engage in a lively and serious debate among themselves: some say Islam the religion provides motive, others say it's a modern extremist variant of the religion, known as radical Islam or Islamism. As a participant in the latter debate, here's my argument for focusing on Islamism. 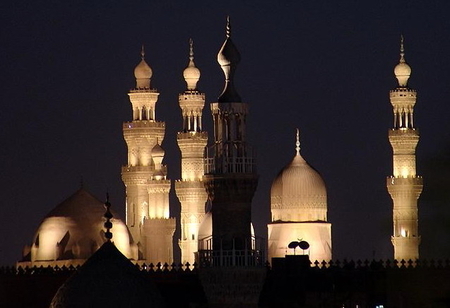 Cairo's Al-Azhar Mosque, completed in 972, represents one height of Muslim culture. Those focusing on Islam itself as the problem (such as ex-Muslims like Wafa Sultan and Ayaan Hirsi Ali) point to the consistency from Muhammad's life and the contents of the Koran and Hadith to current Muslim practice. Agreeing with Geert Wilders' film Fitna, they point to striking continuities between Koranic verses and jihad actions. They quote Islamic scriptures to establish the centrality of Muslim supremacism, jihad, and misogyny, concluding that a moderate form of Islam is impossible. They point to Turkish prime minister Recep Tayyip Erdoğan's deriding the very idea of a moderate Islam. Their killer question is, "Was Muhammad a Muslim or an Islamist?" They contend that we who blame Islamism do so out of political correctness or cowardliness. To which, we reply: Yes, certain continuities do exist; and Islamists definitely follow the Koran and Hadith literally. Moderate Muslims exist but lack Islamists' near-hegemonic power. Erdoğan's denial of moderate Islam points to a curious overlap between Islamism and the anti-Islam viewpoint. Muhammad was a plain Muslim, not an Islamist, for the latter concept dates back only to the 1920s. And no, we are not cowardly but offer our true analysis. Islam is the fourteen-century-old faith of a billion-plus believers that includes everyone from quietist Sufis to violent jihadis. Muslims achieved remarkable military, economic, and cultural success between roughly 600 and 1200 c.e. Being a Muslim then meant belonging to a winning team, a fact that broadly inspired Muslims to associate their faith with mundane success. Those memories of medieval glory remain not just alive but central to believers' confidence in Islam and in themselves as Muslims. 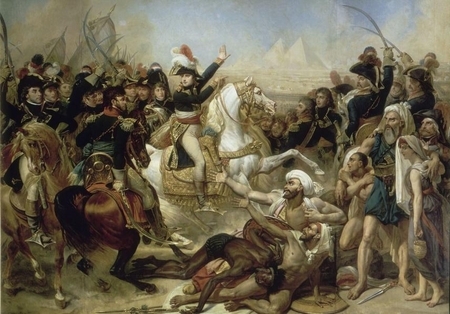 The modern Muslim trauma begins: Napoleon at the Battle of the Pyramids, 1798, as imagined by Antoine-Jean Gros. Major dissonance began around 1800, when Muslims unexpectedly lost wars, markets, and cultural leadership to Western Europeans. It continues today, as Muslims bunch toward the bottom of nearly every index of achievement. This shift has caused massive confusion and anger. What went wrong, why did God seemingly abandon His faithful? The unbearable divergence between premodern accomplishment and modern failure brought about trauma. Muslims have responded to this crisis in three main ways. Secularists want Muslims to ditch the Shari'a (Islamic law) and emulate the West. Apologists also emulate the West but pretend that in doing so they are following the Shari'a. Islamists reject the West in favor of a retrograde and full application of the Shari'a. 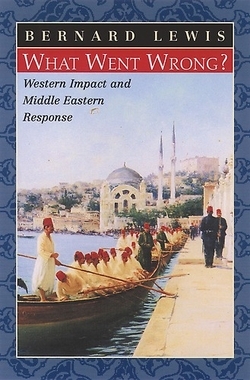 Bernard Lewis published a book in 2001 titled What Went Wrong. Islamists loathe the West because of its being tantamount to Christendom, the historic archenemy, and its vast influence over Muslims. Islamism inspires a drive to reject, defeat, and subjugate Western civilization. Despite this urge, Islamists absorb Western influences, including the concept of ideology. Indeed, Islamism represents the transformation of Islamic faith into a political ideology. Islamism accurately indicates an Islamic-flavored version of radical utopianism, an -ism like other -isms, comparable to fascism and communism. Aping those two movements, for example, Islamism relies heavily on conspiracy theories to interpret the world, on the state to advance its ambitions, and on brutal means to attain its goals. Supported by 10-15 percent of Muslims, Islamism draws on devoted and skilled cadres who have an impact far beyond their limited numbers. It poses the threat to civilized life in Iran, Egypt, and not just on the streets of Boston but also in Western schools, parliaments, and courtrooms. Our killer question is "How do you propose to defeat Islamism?" Those who make all Islam their enemy not only succumb to a simplistic and essentialist illusion but they lack any mechanism to defeat it. We who focus on Islamism see World War II and the Cold War as models for subduing the third totalitarianism. We understand that radical Islam is the problem and moderate Islam is the solution. We work with anti-Islamist Muslims to vanquish a common scourge. We will triumph over this new variant of barbarism so that a modern form of Islam can emerge. May 13, 2013 addendum: This article updates and summarizes a longer version, "Islam and Islamism - Faith and Ideology," I published in the National Interest, Spring 2000. May 18, 2013 update: The article above has been misinterpreted, for example by Walid Shoebat who states that "Pipes makes an unsubstantiated claim that a majority of Muslims are moderate and that Islamism is only supported by 10-15 percent of Muslims." No, I do not claim that 85-90 percent of Muslims are moderate. Let's use more precise language. I estimate that a very small percentage of Muslims are actively opposed to application of the Shari'a and can be defined as anti-Islamists. That leaves a vast body that includes traditionalists, Sufis, Islamic supremacists, and completely apolitical types. I do not characterize them as moderate. I only call them not Islamist.